There’s somewhat of a consensus regarding Le’Veon Bell and his future in the NFL: He’s a really talented running back, perhaps even one of the best, but he isn’t worth the price tag currently tied to his name given his positional value in today’s’ NFL. He’s earned high grades across heavy workloads, impacts the passing game positively and makes big plays, but paying him $15 million-plus is still not a quality investment. 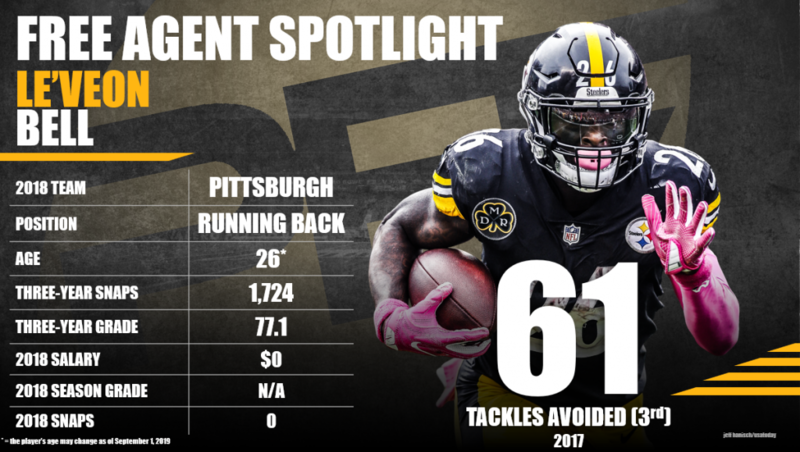 Prior to sitting out the 2018 season, Bell earned 71.6-plus overall grades in all five of his first years in the NFL, displaying both a high floor and high ceiling all throughout. How much he ultimately gets paid will determine his value, but his high-end talent and production aren’t debatable. Subscribe to Pro Football Focus’ ELITE subscription to research Le’Veon Bell’s grades, advanced stats, snaps and more in Premium Stats 2.0.